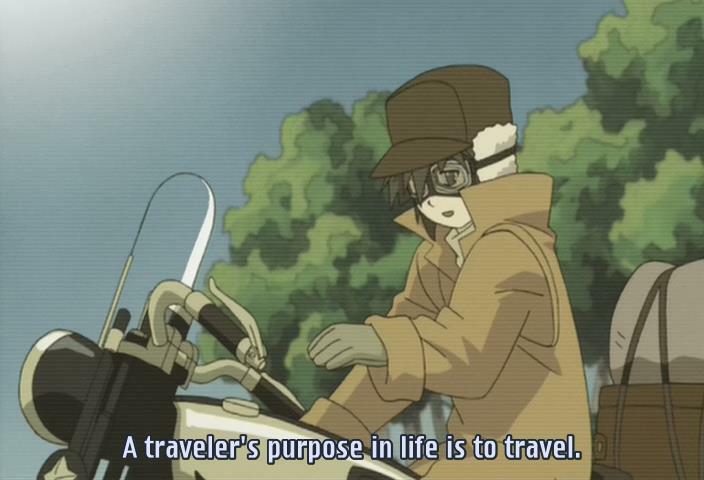 Journey with Kino’s Journey – First Stop – The Value of Experience (Monthly Watch) « Geekorner-Geekulture. There will be a new post on the second (or third if it begins early) Monday of every month (next post: February 11th) , each covering one episode of Kino’s Journey, or the films. You can buy the series here, or watch it dubbed on Hulu here, if you live in the United States. Each write-up might differ in style, length, and focus. I might spend more time on the episode, its ideas, or what it made me think of, or feel. These write-ups assume you’ve watched the episode, and the discussion that’ll follow could be had on the episode, the points I raised, or the questions I pose. Well, let’s get to it. Well, this was interesting. This reminded me more than a tad of Mushishi. Travelers who do not wish to get too involved, a new place and a new story each time. Likewise, I suspect the best way to watch this series would be an episode a day. After catching up with what the anime-club needs, I’ll probably watch it that way. 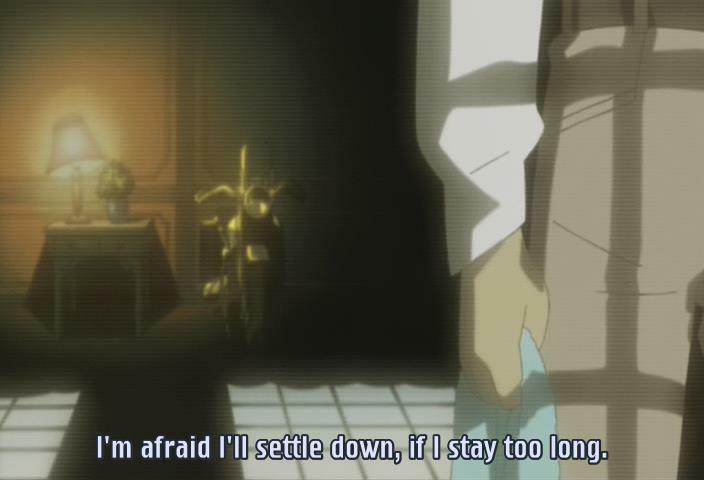 Also, like Mushishi’s Ginko, I suspect we’ll see Kino and Hermes taking a more invested stance at some point. 1) “Hermes”, they said? They actually mentioned “The God of Travelers”, and then Kino said the most important thing for a traveler is luck, right? Hermes is the patron god of travelers, but also of charlatans and gamblers. But when you think about it, travelers are often both. 2) It seems as if Kino ran away? Hermes certainly wants her back. We can also look at them as the twin voices within any wanderer’s soul, the one that wants to see what’s beyond the next hill, and the one who just wishes to settle down, to find a home. “There’s a place for everyone,” meaning each country is right for someone, but there are also those who don’t belong, and they are the travelers – but there’s a place for them as well, and now they need to find it. And they can always go back. 3) Speaking of which, Kino’s desire to travel, manifested as “The Three Day Rule” speaks volumes about her, and speaks more of her than of the world itself. If you settle down, you might experience “the same things”, but that’s mostly with the world. When it comes to people, you experience continuously changing things, the more time you spend with them. Heck, when you meet people for the first time, the experiences with different people are much more similar than the difference you’ll receive when you spend considerably more time with the same people – which can be related to the topic of this episode. “You can learn all you need to of a Country within 3 days,” speaks more about lack of perception, superlative perception, or just interest in the surface details – after all, people are people wherever, so may as well see the “unique nature” of a place. “You can’t trust the world to stay the same, even for thirty minutes,” spoken by Kino, should be the final nail in the coffin – if every place changes, you don’t truly need to go anywhere to experience new things. But of course, when we stay in one place, we think it doesn’t change. Just like when we see a person every day we won’t notice changes as well as someone who sees them once a decade. 4) So why does Kino travel? “If I settle down, I no longer would be a traveler,” so Kino doesn’t travel to escape her past, and so things will constantly change, but to maintain her past, and to maintain her self-identity of a traveler. 5) The Musician – They got into this predicament because they wanted to form a stronger, closer, connection with other people. And they got burnt. This is exactly what all relationships are like, including his desire to form a connection with Kino now. After you get hurt, you run away from the appearance of a new connection, but you still desire it, and you go into it – though opening yourself up also opens you to being hurt again. And yet, you’ll try again, probably. “Alone, you can still entertain yourself” is the other side of the coin – even when we’re together, we’re alone. Locked inside our heads. Except for this country, when they’re locked inside everyone else’s heads, eh? There was a moment about a lie – but if everyone knows something is a lie, is it? If I lie, and you know I lied, and I know you know, is it still a lie? That’s a real question. What purpose does it serve at that point? It’s a form of communication, a form of politeness that can only be shared because we all know what’s the truth, and we all know who is lying and who knows it – and we still do it, for a reason. “Person of the forest” – A named gun, interesting. “Trust people,” said Kino. Hermes is less trusting, which goes well with how she is happy to wander the world but he wants back home. “I’m not the kind to make a road where there isn’t one already.” – Kino will not try to make a connection when one is blocked. She goes where the road goes. She thinks of herself as an outside observer. Which is more valuable? The new experiences we gain from switching locations and meeting new people, or the new experiences we gain as we let people shift over time? 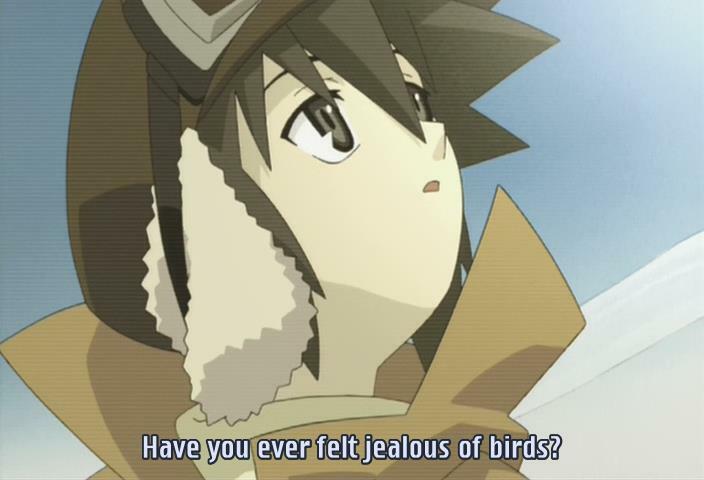 Have you ever been jealous of birds? If a traveler stops being a traveler when they stop traveling, would the decision to stop traveling convey a betrayal of “Self”? Honestly, this specific segment is very classic Greek Philosophy. Is pain part and parcel of human relationships? Is imperfection a source of beauty? Would the world still be beautiful if it were “perfect”? Feel free to answer as many of these as you like, in whichever manner you’d like, and tie these to Kino or to yourselves. Please do not bring content beyond the first episode into the discussion. You can follow the full travelogue here. This entry was posted in anime, Episodic Notes, Things I Like and tagged Kino no Tabi, Kino's Journey, Philosophy, The Beautiful World, Traveling. 1) This is a tough question, but I’d say that more valuable are the experiences one gains from people changing over time. I know journalists who have traveled around the world and yet their mind has remained closed to things. But if one sees someone near them changing, they are much more likely to change opinions and be more welcoming of diversity. 2) I’ve been more jealous of ESPers teleporting than birds :P I like being a human, I think. 3)The question implies that there’s one Self and that it’s unchanging, but we aren’t. We keep the same name throughout our lives in the West -most of the times- because of practical reasons and because society deems it necessary to see a person as a continuing reference rather than a shifting being. In Japan artists changed multiple times names for different stages of their training and career for a period in the past. Change is what happens on multiple levels in our lives (biological, ideological to name a few) and it’s the norm. It’s just the fact that many people are uncomfortable facing these changes that makes them being in denial. Change may bring discomfort after all. 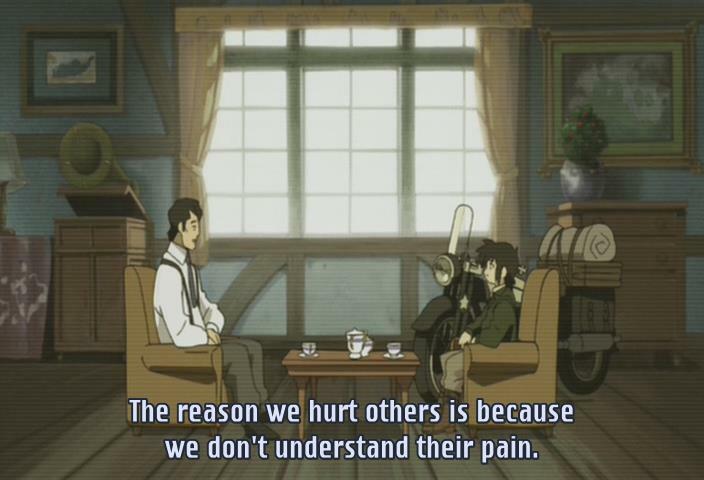 4) Yes, of course pain is part of our relationships, at least the intimate ones. I doubt there’s a family relationship or one between friends or lovers where no conflict arose. It’s a matter of fact since we’re not clones, we are seperate individuals with different ideas and personalities. When we get deeply involved with someone we have certain expectations and more or less we get disappointed when they aren’t fulfilled. If on the other hand you have a superficial social connection with someone, you can pass unscathed. 5) If the world was perfect, the concept of perfection and beauty probably wouldn’t exist. We perceive the things we’ve got by comparing them with their lack. If the changes of nature were non-existent, then this stillness would imply that human beings didn’t have free will, from which every differentiation stems, and without free will there would be no judgement of the perceived reality. Philosophically, this argument may hold some merit, but in practice, I think the two do have their own separate merits. Staying means that a gradual and slow shift can be observed, though the fact that it’s slow makes it hard to observe. Travelling gives you the opportunity to compare places and people who may be completely different, but in exchange for that, you don’t get to actually see the place and people slowly changing. In the end, I think neither has any intrinsic value, because the “observer of change and differences “is an important part of the system. 2) Personally, no. Nor do I remember ever dreaming about flying. But it’s an interesting thought. Maybe I should go birdwatching more often. 3) “If travelling means change(changing locations, etc. ), then does not stopping being a traveller, which could be considered changing the “self”, in itself constitute travel? Can a traveller ever decide to immediately stop travelling? Can a human consciously decide to stop changing? I know, this sounds like something an amateur philosopher would throw at you to try to sound smart(and the last question makes little sense), but it does sort of answer your question. If the decision to stop travelling in itself constitutes travel, then the “self” would not be betrayed by the decision itself. Instead, you’d have to shift forward to when the travel has already ended and look at the travel in retrospect. If the “self” changes when the travel ends, is the previous state of “self” still relevant? 5) This is classic Japanese Wabi-Sabi. Impermanence, imperfection and incompleteness. For someone who practices this school of philosophical thought, this question would probably be easy. However, I won’t bother pretending to even begin understanding it. From a western perspective, this certainly feels like a paradox. We’re supposed to strive for perfection because if we don’t, there’s that nagging feeling that something can still be improved. Perfection is usually defined as a singular point, whereas imperfection occupies a broad range of states of being, which makes it even more difficult to pick a “good” state of imperfection. But, perfection has its own problems. “Perfect things”(first, we need to define the point of perfection) have no interesting qualities. Just imagine a perfectly black perfect sphere. It reflects no light. It’s perfectly round. What’s the point? 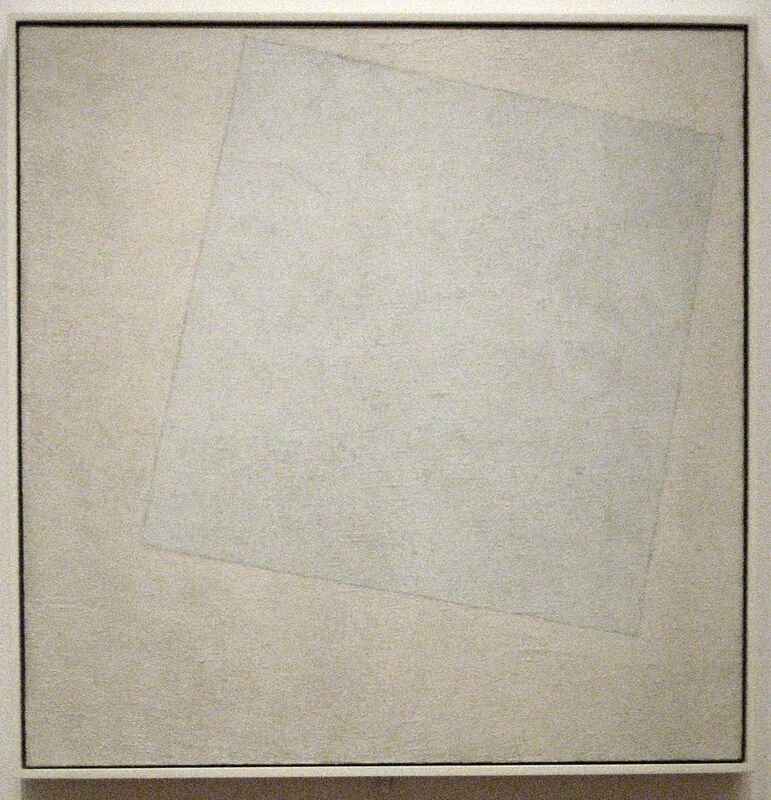 On a more historic note, consider the paintings of Kazimir Malevich. Around the 1910s, he painted stuff like this: http://i.imgur.com/eAWWBDA.jpg and this: http://i.imgur.com/RY5jeUF.jpg . If I recall correctly, he stopped painting stuff like this after he finished the second one. Anyway, this is kinda what I think of when I think of perfection. 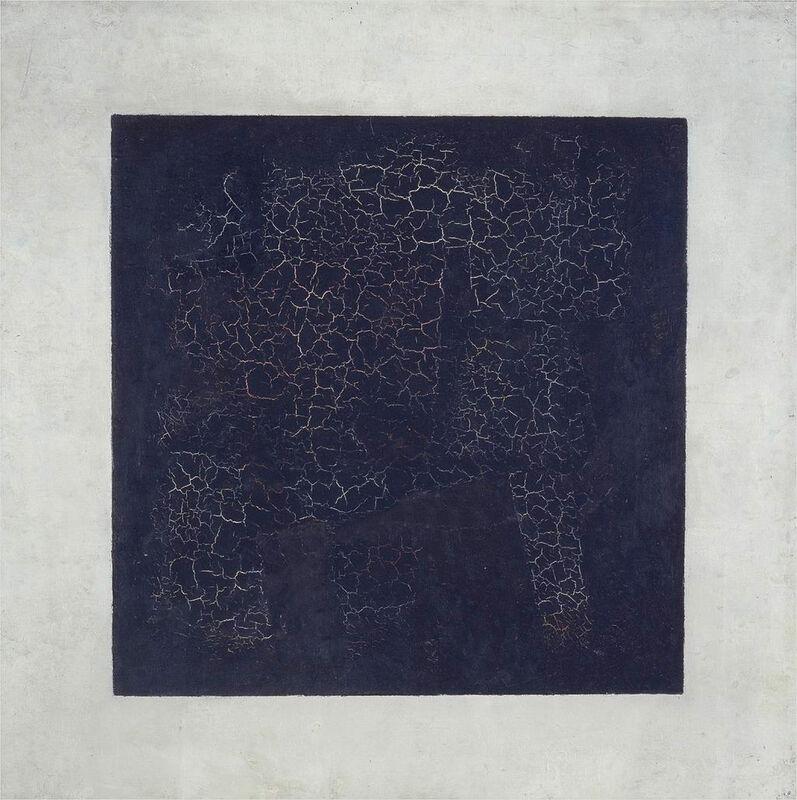 Those paintings are not perfect(especially not the second one), but compared with traditional still lifes, Malevich’s paintings are “more perfect”. And if they were any more perfect than they are, they’d be really, really boring. So, what I’m trying to say is that imperfections are the defining aspects of things. I don’t know if this is connected to beauty, but imperfections are, at the very least, interesting.